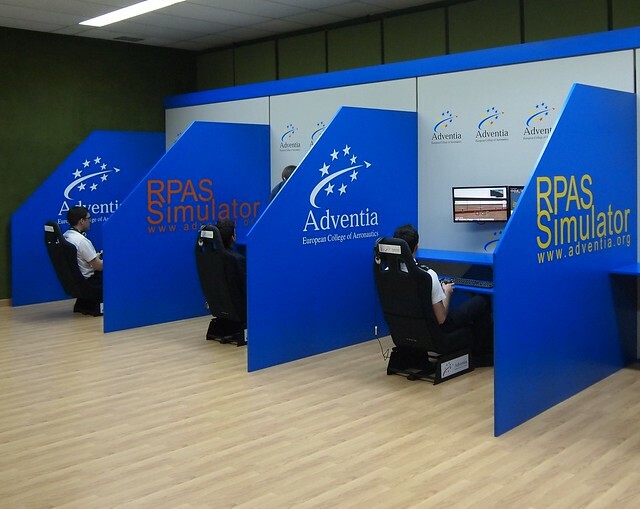 Adventia’s RPAS simulators, part of the simulator centre for drone pilots. The Pilot school Adventia, European College of Aeronautics has presented its Simulator Centre for civil RPAS, unique among all the major international schools. The 19 students who have passed the 60-hour advanced theoretical course will do their practical training there. The future Remotely Piloted Aircraft System (RPAS) pilots who are participating in the practical multirotor programme, will receive an initial practical training of 20 hours, divided into three parts: first, the mechanics of the multirotor devices that they are going to fly, then, simulator practice, using the same controls in a series of missions in different meteorological conditions and finally practice in real flight. The design of the course and training has been entirely carried out by the School and is based on 40 years of experience training commercial aviation pilots, backed by the University of Salamanca. All the information is available in the website: www.escueladepilotosdedrones.com). The launch has been attended by members of the Drone Observatory, which has backed Adventia and in which experts of the University of Salamanca and the Air Force Base at Matacán have collaborated, by a representation of the Ministry of Transport, by members of the Spanish Commercial Aviation Pilots Association, representatives of Salamanca Airport and Senasa. The Pilot School Adventia, participating centre of the University of Salamanca, is the first of the major schools with ATO approval and has an exclusive zone for training civil drone or RPAS pilots. This special room has restricted access and exclusive use for the drones. It is at the Aeronautical Campus in Matacán Salamanca and has three different areas: state-of-the-art simulator centre, mechanics workshop and a briefing area. The Simulator Centre has four state-of-the art devices, which can be adapted to different the RPAS systems currently manufactured, which means they can be used for virtually 90% of all the models now on the market. In the case of the students on this particular programme, they will learn to fly one of the most commercial drones, namely the quadcopter, which is highly in demand by the audiovisual industry. Once they get to know the device perfectly and have carried all the missions designed by Adventia instructors successfully, they will be able to pilot the drones in the open air, always with the back-up of dual control, so that the instructor can take over should the need arise. In assembling this Simulator Centre, Adventia has relied on the broad experience in military UAS simulation, thanks to teachers and collaborators from the Air Force, and in fact, has used suppliers approved by the Ministry of Defence for its installation. Thus, the investment made by Adventia, European College of Aeronautics for this new line of training in its first phase exceeds 50,000 euros. As the legislation and the industry evolves, Adventia plans to expand that investment in accordance to market needs. In order to launch this programme in training civil drone pilots, Adventia has made use of its 40-year experience in training commercial aviation pilots and of the collaboration of experts in RPAs from the Ministry of Defence. Therefore, an advanced course has been designed, the only one approved by the Spanish Civil Aviation Authority (AESA) according to the Regulation from 31st July 2014 and which relies on ten different instructors (engineers, experts in aeronautical training, university doctors and commercial pilots with military experience and training in RPAS/UAS). In fact the first practical class will be given by Douglas McConnell, former USAF military attaché, now in Matacán. Therefore, the Pilot School Adventia has designed an “ab initio” programme to train top-class drone or RPAS pilots, which guarantees a solid technical and theoretical knowledge base, which will put them in a position to fly more complex RPAS systems, prior authorisation by each manufacturer to operate their system. This top quality training will be another step in efforts to ensure safety in the operation of drones.